It's the most wonderful time of the year, and although we may be a little partial, we feel the best way to get into the holiday spirit is with a warm and delicious specialty Minneapolis pizza from Tasty Pizza. 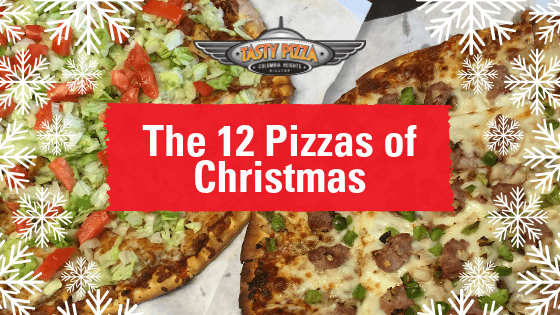 We have so many specialty pizza options that we're going to celebrate each one in a little ditty we like to call "The 12 Pizzas of Christmas" set to the tune of a well-known song you may have heard of. On the First Day of Christmas, Tasty Pizza Gave to Me — a Large Nordeaster That's Ready to Eat! A Nordeaster from Tasty Pizza is our own original spin on the classic pizza pie. This Eastern-European inspired dish has Polish sausage, sauerkraut, onion and cheddar cheese. 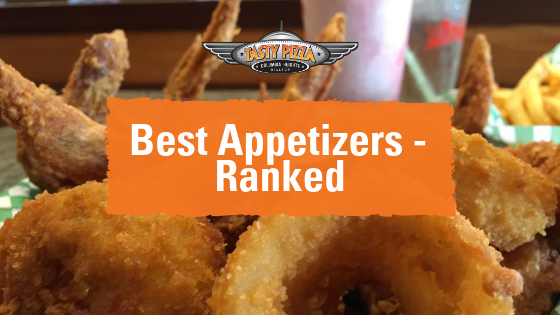 Call it an homage to the early European settlers to our region or call it crazy — one bite, and you'll be calling it delicious. The Tasty Highlight sausage pizza keeps things simple. Topped with green peppers and onions as well as our homemade sausage, this pie proves you don't need a ton of toppings to have an explosion of flavor. Everything you love about tacos tops our zany and delectable Taco Pizza, such as juicy hamburger meat perfectly spiced and paired with taco sauce. It also features cheddar cheese, fresh tomatoes and lettuce, as well as crunchy tortilla chips. Say aloha to your new favorite specialty pizza. Our Hawaiian is a sweet and savory concoction topped with scrumptious Canadian bacon and fresh, juicy pineapple. On the Fifth Day of Christmas, Tasty Pizza Gave to Me — No Meat Just Veggie! Don't want meat? No problem. Our Veggie is a medley of your favorite vegetables including earthy mushrooms, onions, green peppers, and black and green olives. The Veggie proves you don't need meat to pack a flavor punch. Funny name — serious flavor. Our Garbage pizza lets you create your own fresh take on the pizza pie. Choose any six toppings for a smorgasbord of unforgettable taste. Each time you order the Garbage, you can change it up until you find your perfect blend of flavors. This classic pizza features all Italian flavors you love — mozzarella and parmesan cheese, fresh tomatoes, olive oil, garlic and a medley of Italian herbs. If you love meat as much as we do, then you won't want to miss the Tasty High Five topped with only meat. Hamburger, homemade sausage, pepperoni, Canadian bacon, Polish sausage — need we say more? On the Ninth Day of Christmas, Tasty Pizza Gave to Me — Tasty’s Whiteout Special, Yes Please! If you're dreaming of a white Christmas, then Tasty's Whiteout is the pizza for you. Our signature white sauce is paired with onions, tender chicken and crisp broccoli. If you love Buffalo chicken wings and you love pizza, then you will adore our Buffalo Chicken pizza. We have created our own zesty Buffalo sauce and topped it with chicken, as well as mozzarella and cheddar cheese. 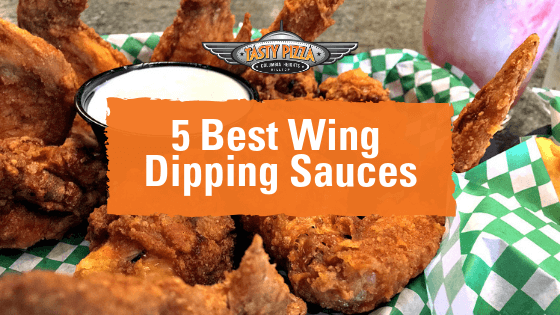 If it gets a little spicy for you, we provide a side of ranch or blue cheese dressing for dipping. 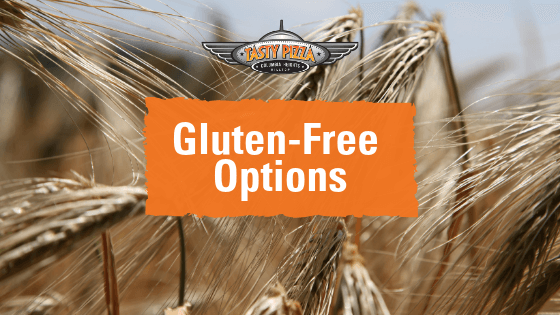 The Tasty Variety is the perfect pizza to try when you're not sure what you want. 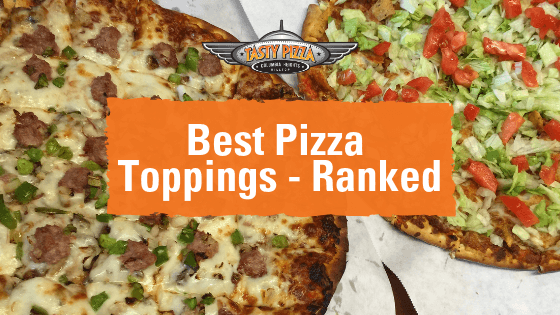 If you're looking to sample something new, but you don't feel like choosing the toppings yourself, the Tasty Variety does all the hard work for you. This pizza features a classic blend of flavors — hamburger meat, homemade sausage, pepperoni, mushrooms, onions and green peppers. 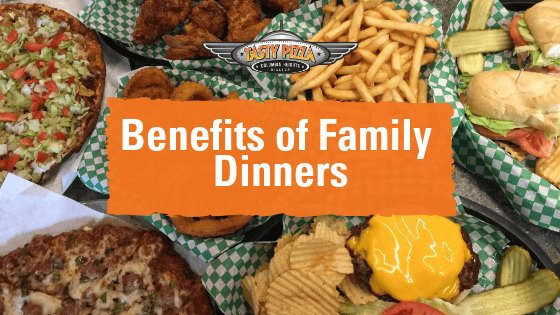 At Tasty Pizza, we make a habit of combining our favorite foods. We take our No. 1 food — pizza, of course — and jazz it up with toppings you wouldn't expect. Take our Bacon Cheeseburger pizza. It features toppings that are usually found between two buns — hamburger, crispy bacon, cheddar and mozzarella cheese, onions and, yes, even pickles. If you're as ready for Christmas as we are, then why limit it to one day? Celebrate the 12 days of Christmas with Tasty Pizza. You can order a specialty pizza online that corresponds to that particular day of Christmas. That way, you mix things up for dinner every night with a different flavor for each day. Order a Nordeaster for the first day of Christmas or jump ahead to the 10th day and a Buffalo Chicken pizza. We think nothing says Christmas like a delicious specialty pizza from Tasty Pizza. Give us a call at 763-571-2722 for fresh pizza delivery in Minneapolis today. Copyright © 2018 Tasty Pizza· All rights reserved.